Formula Atlantic flourished in the UK in the early 1970s with huge fields during its peak period of 1972-1974 and proved a stepping stone for a number of drivers on the way to F1, notably Alan Jones, Tony Brise, Gunnar Nilsson and Tom Pryce. In total, ten UK Atlantic race winners competed in Grands Prix. It was dropped by MCD after 1975 but continued for one more season as Indylantic. After a two-year break, it returned in 1979 but was thereafter just a form of club racing. Non-championship race wins are shown in brackets. Starts in non-championship races are shown in brackets. A remarkable total of 21 different constructors' cars started championship races in 1974. Note that not all results are complete so the race starts table will include cases where it is not certain whether a particular car and driver started a race. These numbers will change slightly as more data becomes available. Non-championship wins are shown in brackets. No more that three constructors won races in any season of the 1979-1983 period; no less than four had won races in any season in the 1971-1976 period. Starts in non-championship races are shown in brackets. F2 or libre cars running in the same race are not counted. The results here have been compiled by Chris Townsend using Autosport and Motoring News augmented by results sheets provided by former competitors. Not all the results are complete: entry lists, results sheets, details of non-starters, grid sheets or details of qualifying are needed for a number of races. These are detailed in the individual season pages. Chassis identification is largely from details of previous owners of second-hand cars (typically F2 cars which have been identified from F2 reports), chassis plate observations by Adam Ferrington and others plus constructor production records for March, Chevron, Lola, Royale and Lotus. Modus and Palliser production records may still exist somewhere and copies would be most welcome. 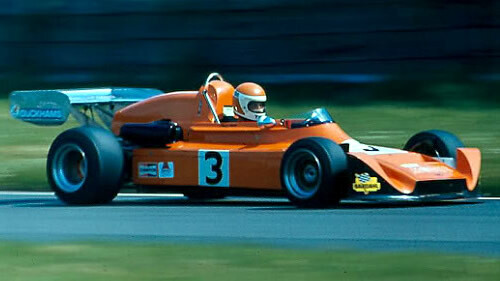 Apart from Alan Jones, Tony Brise, Gunnar Nilsson and Tom Pryce already mentioned, other top drivers in UK Formula Atlantic include Vern Schuppan, Tom Belsø, Bill Gubelmann, Cyd Williams, John Nicholson, Colin Vandervell, David Purley, Jim Crawford, Tony Trimmer, Ray Mallock and Alo Lawler.